Cruise passengers, welcome to Art Deco Napier! On your visit to Napier, don't miss a guided tour of this fascinating heritage city. With a number of tours there will be a time to coincide with the hours that you are on shore. Walking tours depart from the Art Deco Centre, only 100 metres from the shuttle drop off at the Napier Isite visitor centre. Our 75 minute Vintage Car tours have access to the Napier Port and can pick you up straight from your cruise ship, experience Napier in absolute vintage Luxury or enquire in store for a number of different options for a unique experience. Discover Napier's Art Deco Heritage Book Now! 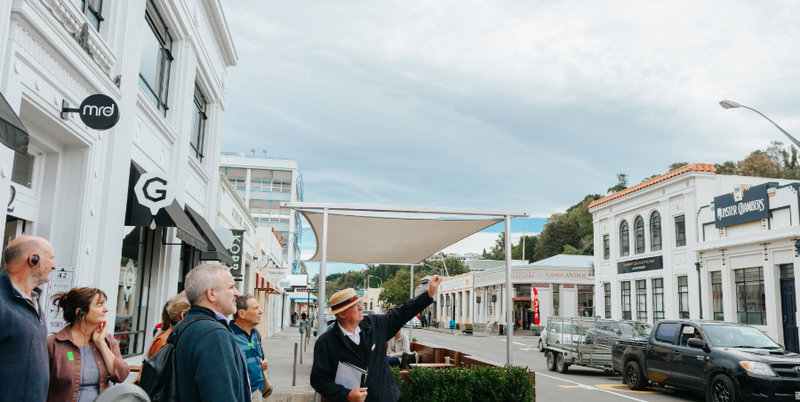 This one hour Art Deco encounter takes you on a walk back in time through Napier's Art Deco Quarter. Your experienced local guide will tell you stories of the 1931 earthquake and the people that were affected by this dramatic and devastating natural disaster. Along the way you'll discover the Art Deco style in which the city was rebuilt in a remarkable 22 months. Your one and a half hour guided tour starts with a viewing of 'The Day that Changed the Bay' a short film about the Hawke's Bay earthquake of 1931. The distance covered is just over 1km, at an easy walking pace suitable for all ages and fitness levels. Make your booking online and you will be offered a selection of departure times to choose from. We look forward to welcoming you to Art Deco Napier!